Earlier this month I managed to raise more than £600 for The Brain Research Trust with my charity auction. It turned out the original winner of the signed Wicked programme obviously wasn’t a trustworthy person as he failed to complete payment (shame on you!). However, the programme found a new owner nevertheless (and for the original winning price which is wonderful) so no harm done. What has happened now is this: The buyer of the programme has donated it to be given away for free. Such a generous thing to do! 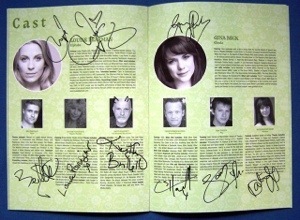 So, here’s your chance to own a Wicked programme signed by the current London cast. All you have to do is this: Find me on Twitter @Steffi_G . Follow me and retweet my competition tweet (I will repost it several times over the next days – retweeting any of those tweets will do!). Not on Twitter? No worries! Just sign up for this blog instead (via the follow button) and drop me an email at theatregirl@gmx.net stating the name / email address under which you have followed the blog. The competition runs until 4th January 2013. Out of all entries I will pick the winner at random on Saturday, 5th January 2013. The winner will be notified via Twitter (or email in case he/she is not on Twitter).